Stylish and contemporary, the Aura™ decorative flylight is an ultra discreet unit designed for front-of-house applications. The Aura™ offers an elegant, modern aesthetic alongside innovative, easy-to-service features and maximum efficacy. 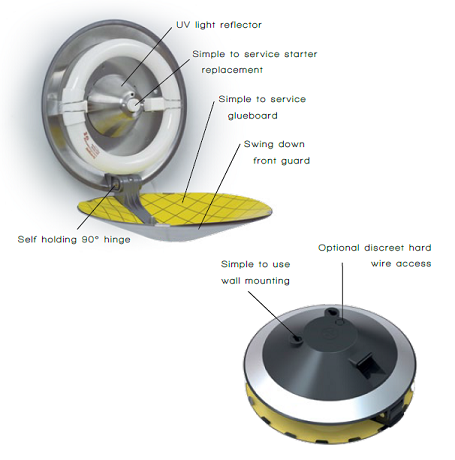 The unique circular registered design of the unit allows light to attract flying insects from a full 360° around the unit, attracted by the patented Synergetic® green light , while the design of the discreetly positioned glueboard gives a 100% useful glue area which remains hidden from customer view. Designed for use in front-of-house areas, decorative flylights discreetly protect areas which are highly visible to customers. Insects are attracted by UV light then retained with highly effective glueboards to ensure that flying insects are kept at bay. Decorative units are ideal for use in restaurants, cafes, hotel lobbies, reception areas, food service and dining areas. Click the button below to add the Aura™ Decorative Fly Light to your wish list.